The first review for Ask Me Anything, the memoir I co-wrote with Marie Rudisill, best known as “The Fruitcake Lady” from her appearances on “The Tonight Show with Jay Leno,” is below. I’m pleased to say that the reviewer awarded it five out of five stars. Ask Me Anything is available from Amazon. The print book has a discount from its list price of $14.95, and the ebook is $8.99, unless you have signed up for Kindle Unlimited. Then it’s FREE. Word-of-mouth is crucial for any author to succeed. If you enjoy the book, please leave a review. Even if it’s just a sentence or two. It would make all the difference and would be very much appreciated. 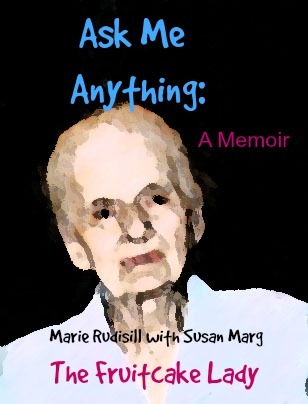 Ask Me Anything is a memoir written by Marie Rudisill with Susan Marg. Marie Rudisill is known to late night television watchers as the Fruitcake Lady. Her letter, written in 2000 to Jay Leno, defending the honor of the fruitcake, prompted his invitation to her to appear on “The Tonight Show.” She was 89 years old at the time. Her appearance was such a success that she was invited back again and again. She taught celebrities how to make fruitcakes and would answer just about any question posed by members of the audience. When the trip out to the West Coast became too difficult for Rudisill, Leno would send out a crew to do her segments at her home. Rudisill was a product of the old South, and this memoir is filled with stories of her life as a child in Monroeville, Alabama. When her father died after an accident, her cousin Jenny took in the widow and her five children. Rudisill’s mother also died several years after, and Jenny raised the three older sisters as her own. Jenny was a self-made woman who built a small millinery business into a thriving department store, and built the rambling house with extensive gardens where she, her siblings and their young cousins lived. Co-author Marg worked extensively with Rudisill on this memoir until Rudisill’s death in 2006. Marie Rudisill’s memoir, Ask Me Anything, is blunt, outspoken and charming, all at once. I immediately felt at home reading her story, even if I did cringe sometimes at some of her statements. Her stories of her childhood in the big house with the flamboyant, and rather alarming, Jenny and her other cousins are marvelous, especially the kitchen wars and the legendary bullwhip Jenny carried around. Rudisill was also Truman Capote’s aunt and she considered him her favorite nephew. Her stories of their friendship and later falling out were parts of Ask Me Anything that I particularly enjoyed. Rudisill and co-author, Marg, are a wonderful writing team. The memoir reads beautifully, with Rudisill’s voice coming forth loudly and clearly, even if she was in her mid-nineties as they worked together. While she’s no longer with us, she’s still very much here in spirit as evinced in Ask Me Anything. I very much enjoyed getting to know Marie Rudisill through her memoir and highly recommend it.